Xiaomi is now known as one of the very few Android OEMs who have released the most modern take on the slider phone. 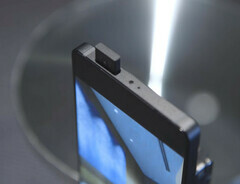 However, it also appears as though it wants to get into the pop-up camera game as well. A company executive has hinted that this may be the case should demand for that kind of device remain high. The Mi Mix 3 may be one of the most innovative phones of recent times. As with the OPPO Find X, the entire screen slides down to reveal a hidden front-facing sensor array. However, unlike the OPPO flagship, the Mi Mix 3's 'slider' is manual (the screen is held in place with magnets in normal use), which eliminates worries about motor or moving part failure in using the hidden camera. As Xiaomi will also reportedly release a more conventional, candybar-style device, the Mi 9, on February 20, you would think the company has all its customer needs covered. However, there is another novel form factor that hides the selfie camera in order to maximize real estate: the pop-up camera. This sees a module rising from its own little housing in the top edge of the phone. It was introduced by vivo in the 2018 Nex line, and has been found worth adopting by OPPO into their newest upcoming release, the F11 Pro. According to ITHome, a number of Xiaomi fans have been clamouring for this feature on the OEM's official Weibo channel.